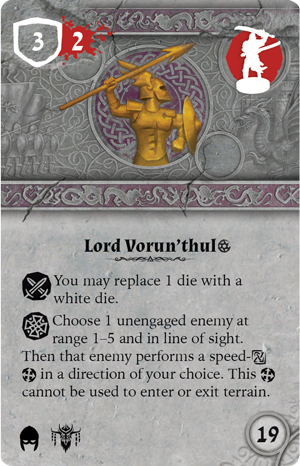 Order your own copy of the Lord Vornu'thul Hero Expansion at your local retailer or online through our website today! 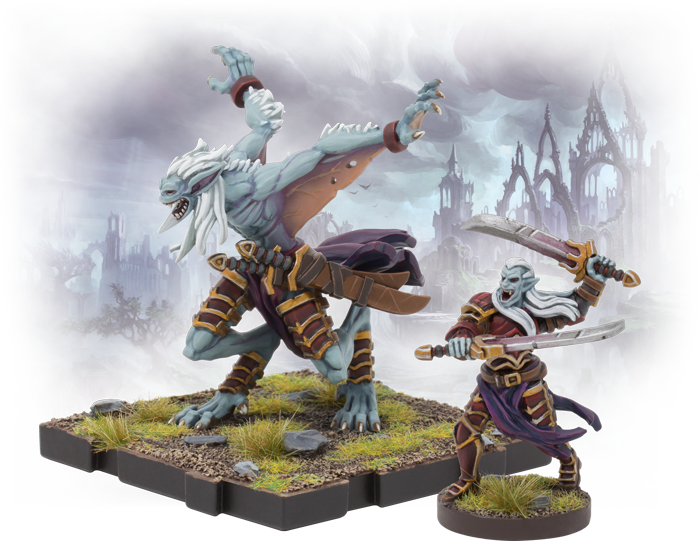 As Terrinoth goes to war in Runewars Miniatures Game, Waiqar the Undying calls upon his most skilled and loyal lords to lead the skeletal forces of his Deathborn Legion. Lord Vorun’thul has had hundreds of years to prove his dedication to his dread master and hone his skills with every instrument of war, preparing himself to face almost any enemy. The few who survive battle with the infamous vampire lord recount the terrifying grace of a swordsmen who cleaves his enemies in two with a single blow. But the remnants of battles that leave no survivors tell a different tale, where courtly grace is abandoned for animalistic savagery. Gruesome remains, sundered armor, and nightmarish claw marks are the only witnesses to the horrors wrought by the cursed Lord of Bilehall. 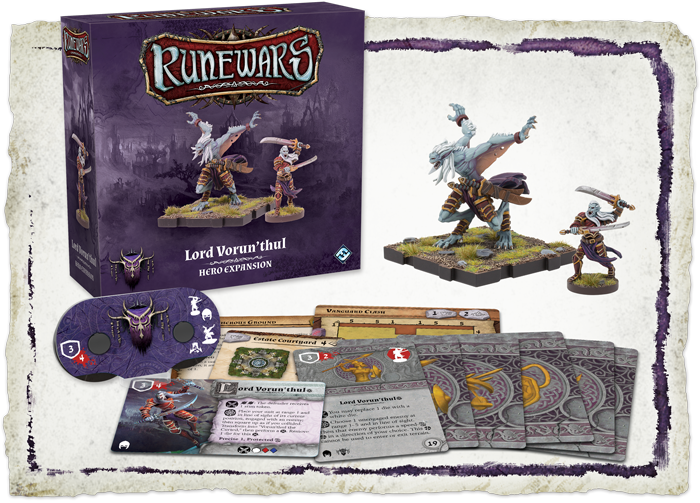 Today, Fantasy Flight Games is pleased to offer you a closer look at the Lord Vorun’thul Hero Expansion for Runewars Miniatures Game—now available for pre-order at your local retailer or online through our website! The men and women of Terrinoth fear all that resides in the Mistlands, but in rare cases, that fear is tinged with fascination. The immortal vampires inspire awe within their prey, and none do so more than the cursed Lord Vorun’thul. Able to transfix with a single look, this servant of Waiqar was once a renowned defender of the land with unquestionable honor. Now, he joins the ranks of the Deathborn Legion, afflicted by the curse of the vampire, which gifts him with immeasurable power and curses him with unending life. When he is surrounded by the carnage of battle, Lord Vorun’thul may give in to the darkness and use a skill action to change forms, shifting between the honorable lord and the monster that he cannot accept as part of himself. While he is Vorun’thul the Cursed, the lord becomes both Brutal and Lethal, and loses part of his reason, unable to perform green actions or modifiers. Only a complete disengagement from the bloodshed, no matter how brief, can return him to his former self, and even then the transformation takes its toll as he becomes stunned. But no matter how Vorun’thul appears before his opponents, when the vampire takes to the battlefield, enemies of Waiqar are sure to feel the icy shiver of fear running down their spine. The Lord Vorun’thul Hero Expansion provides you with everything you need to add the vampiric lord to your Deathborn Legion, including two unpainted, easily assembled miniatures, one for each of Lord Vorun’thul’s forms and their matching unit cards, as well as a selection of six upgrade cards to highlight both the honorable and the monstrous sides of the lord. While Lord Vorun’thul is deadly in his own right, able to stand alone and face an entire Daqan army without fear, centuries of experience as a military leader have taught him that no war can be won by a single man. Rather, it is the ability of a superior to lead his troops that will determine victory from defeat, and sometimes the best way to inspire your ranks is to walk among them. 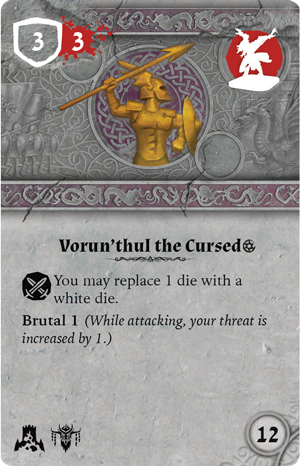 When you use Lord Vorun'thul as a figure upgrade in your infantry, you may replace one of your dice with a white die during a melee. But beyond this, the vampire lord also has the ability to control the minds of his enemies. All he needs is the ability to see them. As a skill action, Lord Vorun’thul may force an enemy within range to shift in any direction he chooses. If you place Vorun’thul among the ranks of your Reanimates, you can use this ability to draw in your chosen victim when you're ready to strike, provide support to a nearby unit and keep them from becoming overwhelmed, or simply keep your infantrymen protected by forcing your opponent to keep their distance! But if the airs and graces of a courtly lord do not appeal to your more bloodthirsty sensibilities, you may instead choose to unleash the beast by using Vorun'thul the Cursed as either a heavy or siege figure upgrade. Similar to infantry upgrade, Vorun’thul’s heavy upgrade enables you to replace one of your dice with a white die during melees. 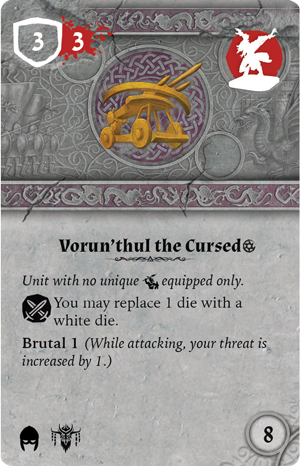 However, where Lord Vorun'thul has a unique skill ability, his more terrifying and bestial form has the simple but devastating Brutal 1 keyword. For the low cost of eight points, you can increase the threat of your Reanimates and make them nearly unstoppable as they march across Terrinoth. Or for twelve points, the blood-crazed warrior may rampage alongside the thirteenth barony's most deadly creatures, tearing Waiqar's enemies to shreds. While there may be none in the Deathborn Legion who currently dare to stand alongside the vampiric beast, there is no telling what else may be hidden in the mists. Whichever version of Vorun’thul you send into battle, you can be sure that the blood of your enemies will flow freely as the Lord of Bilehall surrenders to his thirst and embraces the dark power within. Waiqar the Undying rises again to claim Terrinoth, and with him comes the renewed force of the thirteenth barony and his loyal servants. Step into the mists, embrace the glory of undeath, and discover the true power of the Lord of Bilehall! 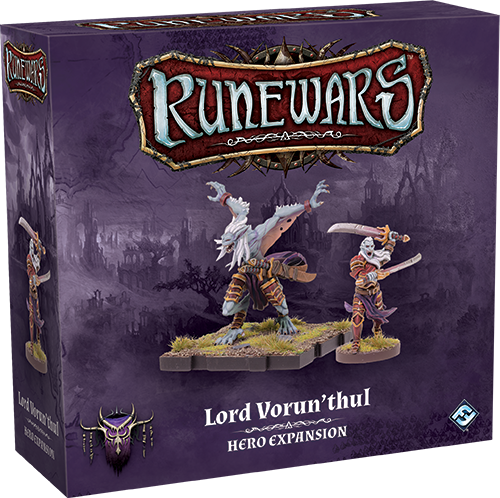 Pre-order your copy of the Lord Vorun’thul Hero Expansion (RWM31) at your local retailer today or on the Fantasy Flight Games website here!